In Minecraft, paths are truly handy because they’re both decorative and useful. They can be small walkways or wide roads. Paths make cities and gardens look nice, but they also make it easy to find places or simply to move from Point A to Point B. Paths most commonly consist of dirt, paved road, or stone sidewalk, although there are several other aesthetically-pleasing materials that can be used to enhance your path designs. See our tips below on how to make and design your roads, paths, or walkways including how to craft appropriate materials, design considerations, and more. If you’re using paths as roads, figure out how long and how wide the road should be. You want to ensure that your road is large enough for any in-game vehicles, if available in your Minecraft realm. Dig out the rows of blocks where you want the road to be. You can dig as deep as you want, but you only need to dig 1 block deep. This is the most efficient use of resources and also ensures that your road or path will be level with the surrounding surface. Gather the materials you need for the path or road. The type of material is up to you, but many people use cobblestone or stone brick. (The rest of this step list works with stone brick.) See our full list of possible ingredients for roads and walkways in the next section. Craft stone bricks by placing 4 stone blocks on the crafting table: 1 stone block in the left bottom box; 1 in the left middle box; 1 in the middle column bottom box; and 1 in the center box. The crafting table change the stones into brick. The crafting table changes those stones into brick. Note: This can be done with stone, cobblestone, and other items. Take the brick and place them into your inventory. Repeat Steps 3 and 4 until you have all the bricks you need to build the path or road. Take the bricks to the road, and place them in the holes you dug in Step 1. The most important part of designing your Minecraft paths is to make the paths feel natural with the rest of your city, garden, or area. If you have a village, keep it simple and use sand or dirt paths. If you have a modern city, use black wool to resemble pavement, or obsidian blocks. Again, you can design roads in Minecraft without using concrete or stone blocks. You can also use blocks of black wool, which can be obtained by acquiring a shear and essentially shaving a sheep! To make a shear, you need 2 iron ingots. Place 1 iron ingot in the left row of the bottom box of the crafting table and the other in the center box. Take the shear that will appear in exchange for the iron ingots. After you make a shear, find a sheep and use the shear to cut off the sheep’s wool. This should give you 1 to 3 wools. Though you can get real obsidian, it’s difficult and dangerous when you’re in Survival mode — that’s why you should use wool to resemble the obsidian. Obsidian is usually only used for a path when you’re in Creative Mode, because you have unlimited resources. If you think that the road is plain-looking, you can jazz it up by adding lampposts, glowstone, signs, banners, and other items along the walkway. Glowstone is one the easiest ways to really make your paths stand out. When you have 4 units of glowstone dust, you can easily make the glowstone. 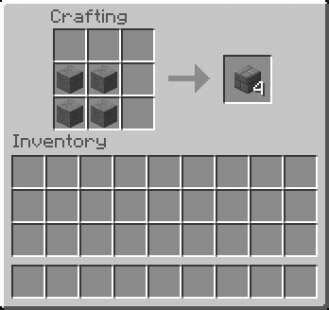 Place the 4 units of glowstone dust on the crafting table: one in the left bottom box; one in the left middle box; one in the middle lower box; and one in the center box. The craft table exchanges the glowstone dust for a lit glowstone. Repeat that process until you have as many glowstone as you need. You can then place the glowstones at strategic places along the road. Make sure that you have 17 blocks of the same material that you used for your path. Stack 5 blocks on top of each other. 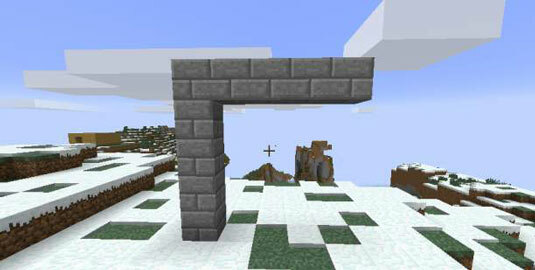 If you want to build the arch higher than you can reach, jump (press the spacebar) and right-click to place a block underneath you. You can do this as many times as you need. Place 5 blocks side by side from the top of that stack. Don’t worry about blocks falling on your head — they hang suspended in the air while you build. Starting at the other end of the horizontal row, build another vertical stack 5 blocks high, working from the top to the ground. Place 1 block in the upper left corner of the arch’s opening. Place 1 block in the upper right corner of the arch’s opening. Congratulations! 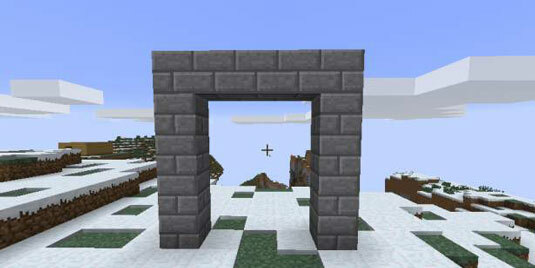 You’ve successfully made an archway.